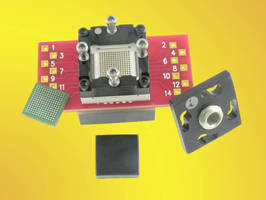 Stamped Spring Pin Socket is suited for 0.5 mm pitch BGA. Designed for Burn-in and Test applications, SBT-BGA-7003 is stamped spring pin with 26 g actuation force per ball and cycle life of 100,000 insertions. Contactor has self inductance of 0.88 nH, insertion loss of less than 1 dB at 20 GHz, capacitance of 0.097 pF, and temperature range of -55 to +180Â°C. Socket also features floating guide for precise ball to pin alignment, while current capacity of each contactor is 4 A at 80Â°C temperature rise. Contactors incorporate electronic coil control design. High Power Contactor features hermetically sealed design. HVDC Contactors meet UL1604, SAE J1171, IP67 and ISO8846 standards. Solid State Contactor accepts 4-20 mA control signal. DIN Rail Enclosure Linking System hastens installation of boxes.